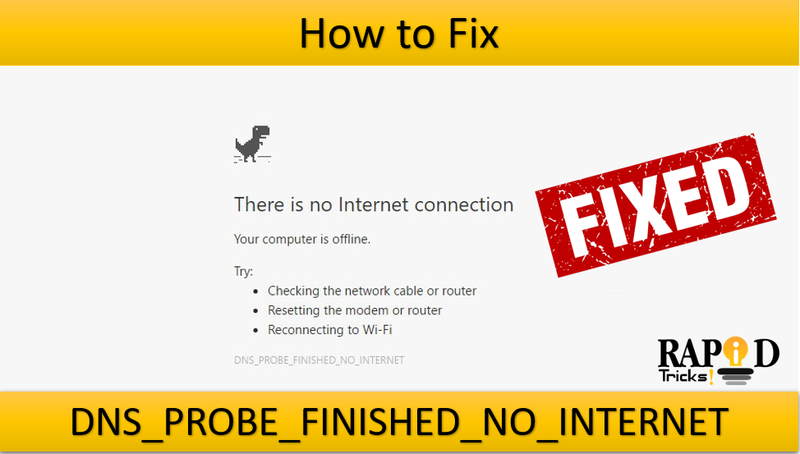 If you are a windows user since long time, then you must have concurred with one error that is DNS_PROBE_FINISHED_NO_INTERNET and it is an error that is so annoying like other errors but it is not that easy to fix DNS PROBE FINISHED NO INTERNET, but if you want to fix it right now, then all you need to do is to follow this complete in-depth fixing guide from RapidTricks experts and you are good to go. First, you don’t need to panic while concurring this error because DNS_PROBE_FINISHED_NO_INTERNET is not that much tough error which will bring tears in your eyes to fix it. It is quite common error in Windows error, and basically, it came in front of you when there is No Internet Connection. You can fix it, by following our troubleshooting process for DNS PROBE FINISHED NO INTERNET. This error isn’t responsible for the Windows 10, Windows 8.1, Windows 8, or Windows 7 based PCs. If you want to fix, then simply start follow us. Here we are going to explain you all the aspect and important elements of the issue of DNS PROBE FINISHED NO INTERNET and at the same time, we are going to introduce different possible methods to fix this issue. We have found some useful methods to fix it as soon as possible, and these four methods along with the last resort tool called Reimage Repair Tool to fix this issue DNS PROBE FINISHED NO INTERNET and we recommend to implement this while reading the methods. There are so many times you encountered with the disconnection of Internet, and the error which we are talking about in this post, whether it is a router issue or anything else, like the internet connection from the ISP or not. If you have a Wi-Fi devices, you can connect your phone. If there is another Wi-Fi devices. If there is some another Wi-Fi devices, watch out that is it getting the internet connection perfectly or not. If it is doing perfectly fine, than it means the router is working well. But if it is not, than here you should contact your ISP that your internet services is not working properly. Press R with Holding the Windows Key. You need to type the “CMD” and then you have to tap on “OK”. In the command prompt with the black screen, here you have to type: ping –t 4.2.2.2. If you find these lines in the same sequence, than it means that the internet is connected perfectly fine. Note: The last number of above sequence would be different but the pattern should be same and it proves that the internet is connected perfectly. If you have checked the modem or the router, it clearly means that it is a software issue not just in the hardware. It is absolutely true that it means, that is might be the issue of DNS Probe Finished No Internet error. At the first, you need to tap on the button of Start and after that you have to look for the CMD. This is a command prompt that means that we are going to open a new command prompt but need to close the previous command that is pinning already. Now make a right tap on the CMD and here you need to select for the option Run As Administrator. The back command prompt will open up. Here you have to type these five commands and hit the enter button after every command. Make it clear that, you must write it as above mentioned, if any single character even the space is missed out, than it will show error in the command. Once you have tried above mentioned method, but find yourself in the same situation to fix the error DNS_PROBE_FINISHED_NO_INTERNET. You should immediately jump onto the third method that is power cycle. First turn off the power of your router as well as modem. You have to wait for just 10 minutes, now make the power on, just by restart the modem. Now, check the data cable (Connected via wired) of internet is connected or the system is connected via the Wi-Fi. Now, here you need to check the command prompt screen, which allow you to check if you are getting the replies or not. Here is the time, when you have to wait for the few minutes, after you are powered on. It is the error of DNS PROBE FINISHED NO INTERNET is not resolved you can jump on the next method. Before jumping directly into the method 4 and you need to give a try to the above methods first. Once you have tried but could not find the positive result and you can jump to the next solution here. It is a method that is Reset Google Chrome to fix DNS_PROBE_FINISHED_NO_INTERNET. You have to follow below steps to implement this method. First, you have to tap R while holding the Windows Key. Run dialog box, that opens up and you need to type exact text which we have mentioned below. Once you typed any of the command in the open box, you have to tap on OK button. This will allow the Windows Explorer to open some folders too. So, now you have complete information about fixing the DNS_PROBE_FINISHED_NO_INTERNET error. Drop your queries in the comment section below.